A female Monarch butterfly is ovipositing (laying eggs) on the milkweed growing in the Container Butterfly Garden. YAY! Stay tuned. 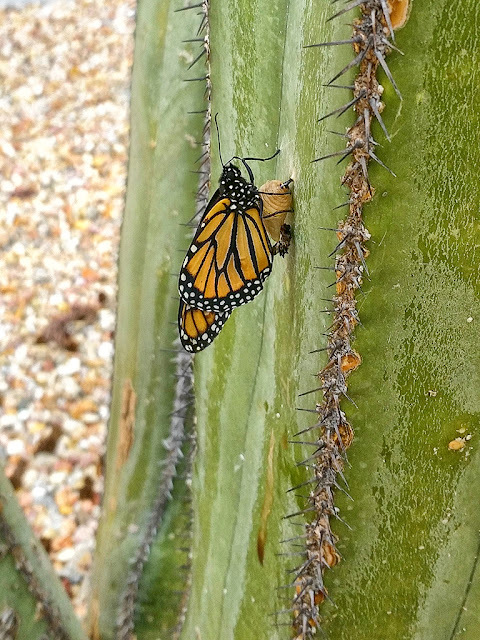 I came across a Monarch butterfly that recently eclosed (hatched, or emerged) Thursday morning when hunting down weeds. It's a little girl, but I don't think she's too healthy. Her chrysalid is smaller than normal. Conversely, she is too. Thankfully, tachinid flies didn't find her first before she turned into a chrysalis. 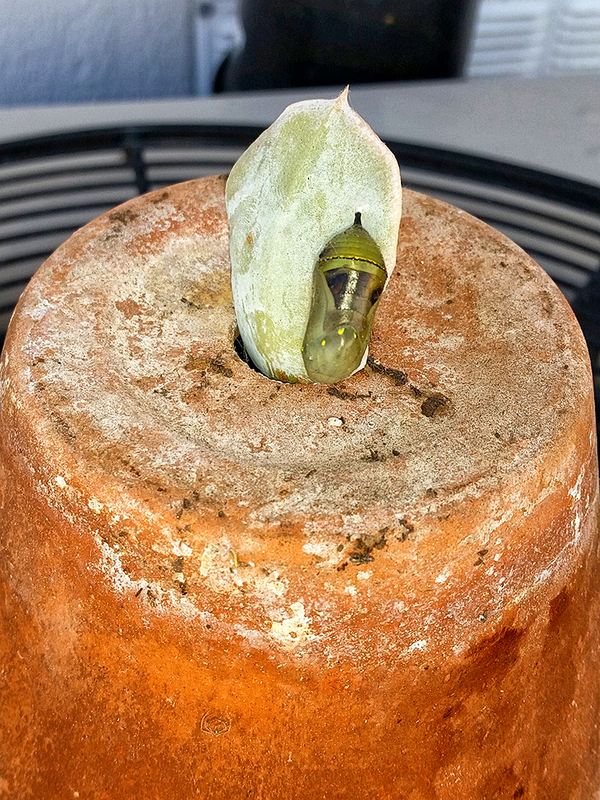 The chrysalis above hasn't changed much in the several weeks (month+, really) I've had it. 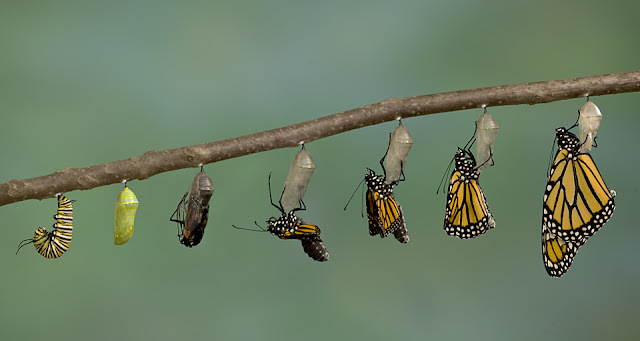 Normal time for a caterpillar to emerge as an adult butterfly takes two weeks roughly. From its color and abnormal length of pupation, I suspect it will produce tachinid fly maggots instead of a beautiful butterfly. Nice metamorphosis photo chronicling the steps a Monarch butterfly caterpillar takes from forming a "J" to eclosing as an adult. 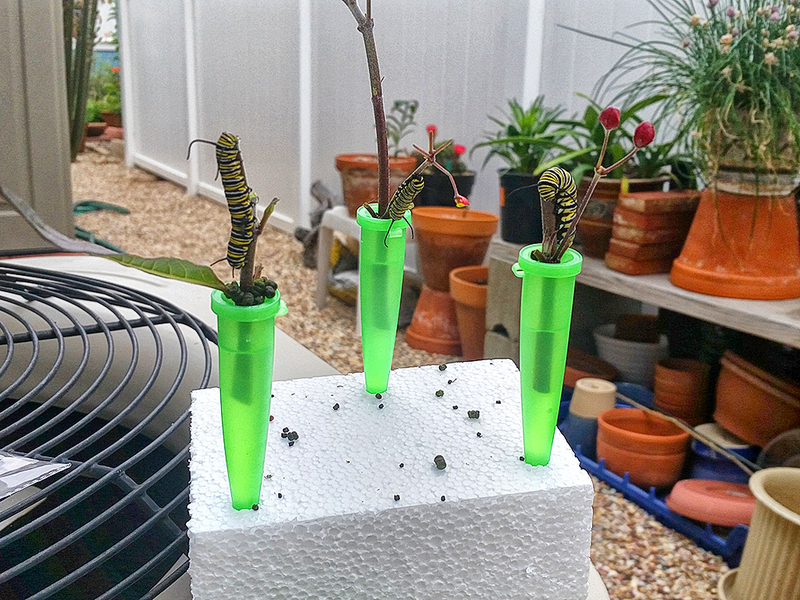 Three Monarch cats I found as eggs I'm raising are doing great. 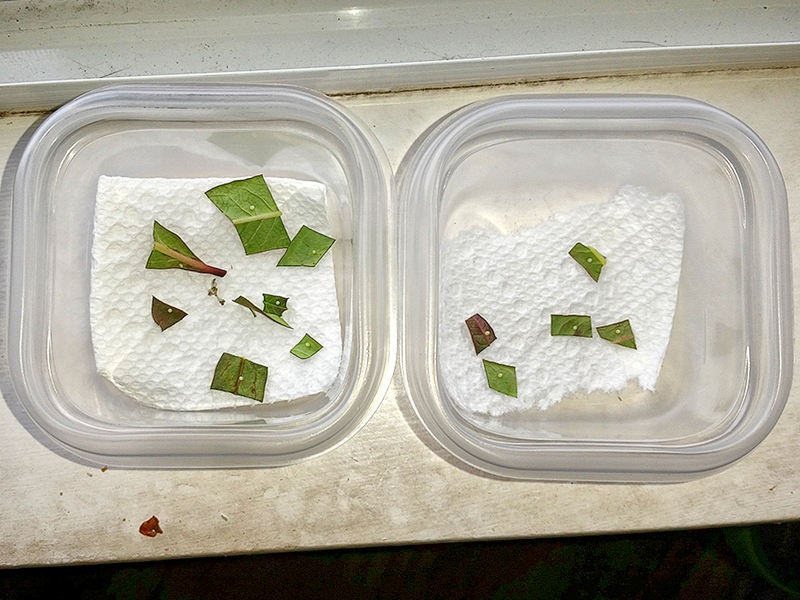 It's amazing how fast they grow after the 3rd instar phase! Looks like they'll blow right through the 4th, whiz past the 5th, and turn into chrysalides very soon. 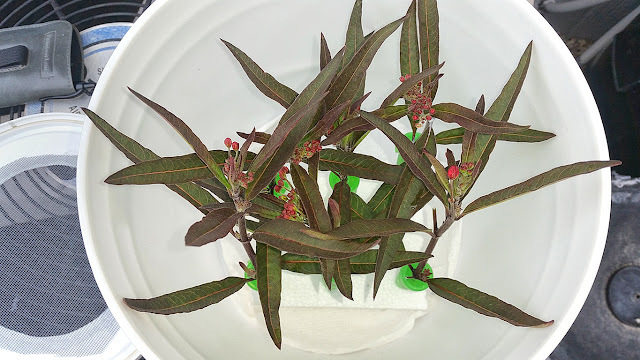 Went for another egg hunt in the container butterfly garden a few days back, looking for Monarch eggs deposited under milkweed leaves. This time I didn't get skunked and found nine, so a female did come through to oviposit. I'm sure the nine come from a single mom, as all were laid on the same plant. Left: first batch of 9. Right: second batch of 5. The three healthy cats have devoured the milkweed I gave them just a couple of days ago. 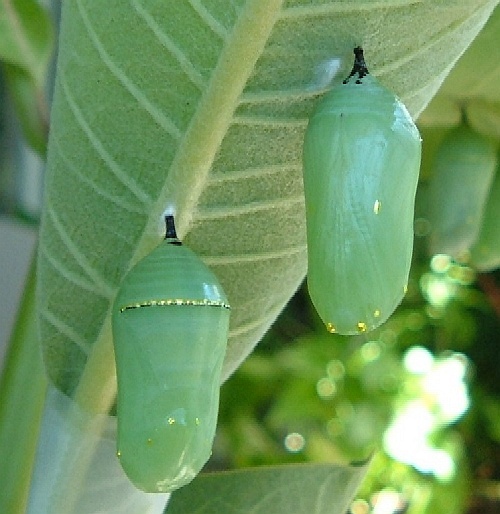 At the 4th instar stage, they have turned into eating and pooping machines. ¿Donde esta las orugas? Where are the caterpillars? With fresh food, the three cats took no time settling in safely under a canopy of milkweed leaves, sequestered in their modified 2 gal. 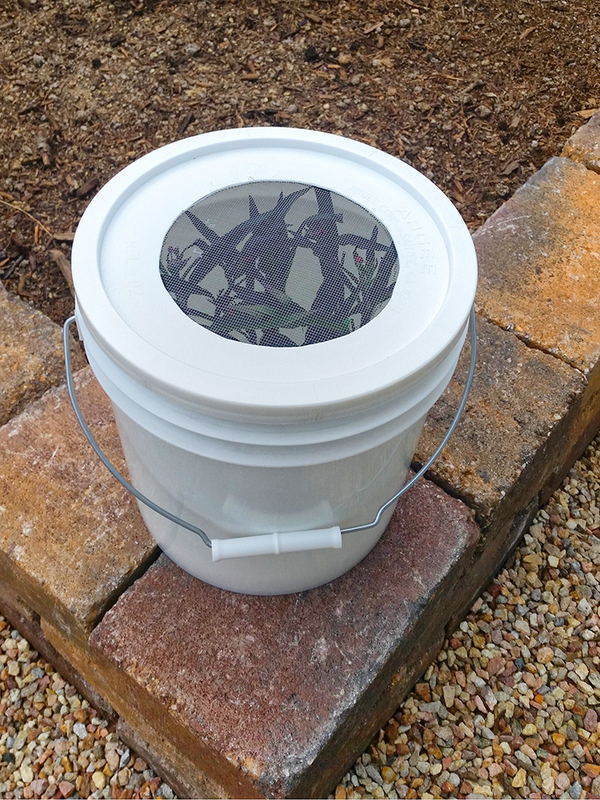 paint bucket. For the next feeding they'll have to go into their eclosing cage for a final 5th instar stage before turning into chrysalides. 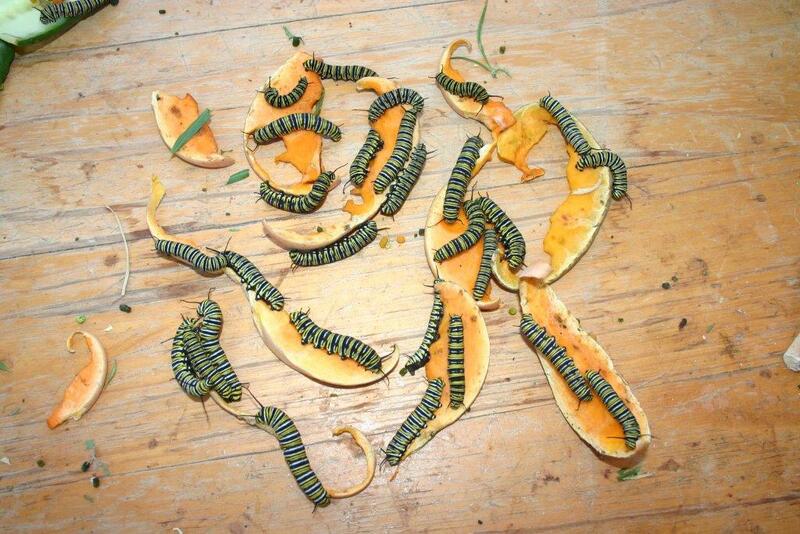 5th instar cats noshing on squash.